The Environmental Protection Agency’s Significant New Alternatives Policy (SNAP) program has begun reducing reliance on HFC refrigerants used in chillers. International chiller manufacturers already are transitioning to new refrigerants, ahead of EPA’s actions, to meet requirements in the European Union and elsewhere. “EPA has just started to address the issue of GWP in the air conditioning sector,” observes Karim Amrane, senior vice president of regulatory and international policy at the Air-conditioning, Heating, and Refrigeration Institute (AHRI). Regulation of refrigerants is nothing new, of course. The phaseout of refrigerants like CFC-11 and -12 and HCFC-22 was the result of their potential for ozone depletion. HCFC-123 is scheduled to be phased out of production for new chillers by 2020. At this point, EPA has yet to decide whether to issue allowances for production of HCFC-123 to service existing chillers beyond 2020. But even if EPA decides to ban further production, Amrane sees no reason for facility managers with legacy chillers to be concerned. “While virgin HCFC-123 may no longer be produced, they will be able to purchase reclaimed HCFC-123, just as reclaimed (CFC refrigerants) still can be purchased,” explains Amrane. Alternatives to HCFC-123 are not designed for use in existing equipment, but they are available in new chillers. “One in particular that is already being marketed is HFO-1233zd,” Amrane says. HFC refrigerants like HFC-134a were not a threat to the ozone layer, and so were not included in the earlier phaseouts. But concerns about GWP led the SNAP program recently to announce another round of cuts to hydrofluorocarbons that includes those commonly used in commercial chillers. “As the phaseout of HCFCs progresses and as concerns about the use of high-GWP HFCs like HFC-134a rise, manufacturers are transitioning to new refrigerants containing olefins,” says EPA. On April 18, 2016, EPA proposed to change the status of several HFCs and HFC-blend refrigerants for use in new centrifugal and positive displacement chillers as of Jan. 1, 2024. The proposal supports President Obama’s Climate Action Plan and will help the United States meet its climate commitments under the December 2015 Paris Agreement. The EPA action follows a joint petition for action from the Natural Resources Defense Council and AHRI. NRDC and AHRI specifically called for removal of HFC-134a, R-410A, and R-407C from the list of acceptable substitutes in all new air-cooled and water-cooled chillers using centrifugal, screw, scroll, and all other compressor types. The primary difference between EPA SNAP’s proposal and the joint petition for action is that EPA proposes no new chillers with the older refrigerants after Jan. 1, 2024, one year earlier than the NRDC-AHRI letter. NRDC-AHRI’s petition asked for eight years from publication of the final rule (Jan. 1, 2025) so that manufacturers could finish designing and bringing to market chillers using alternative refrigerants. In addition, the extra year allows more time to update building codes for the new refrigerants. Meanwhile, California is discussing limiting refrigerant GWPs in air conditioning by 2021, well ahead of EPA, according to Amrane. • trans-1-chloro-3,3,3-trifluoroprop-1-ene, which is also known as 1233zd(E). 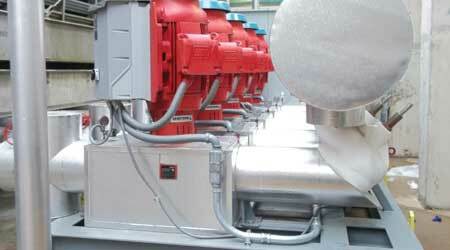 Ammonia, either in vapor compression chillers or in an absorption chiller, may also be used. Both EPA and chiller manufacturers have additional motivation to move forward on alternatives to high GWP refrigerants. Globally, world leaders, including President Xi of China along with President Obama, recognize the need to address HFCs. In January 2015, the European Union’s F-gas regulation began limiting the amount of HFCs that can be placed in the market. EU’s HFC phasedown provisions aim to reduce by nearly 80 percent the allowable amount of HFCs sold annually by 2030. Switzerland, which remains autonomous, prohibits the use of HFC-134a in large chillers. China requires reporting of bulk HFC imports. Denmark, Norway, Slovenia, and Spain tax HFCs. Japan prohibits the use of R-410A in new equipment in the 2018 to 2020 timeframe. In addition, an amendment to the Montreal Protocol, an international treaty designed to protect the ozone layer, is progressing. An HFC agreement is expected to be presented to the parties in Rwanda this October. The amendment is expected to have more stringent requirements for developed nations and more lenient levels for developing countries.